Are you someone who wants to throw in every kind of supplement there is just to make sure your dog is getting the minimum nutrients he needs in his food? Well, you wouldn’t be alone. Supplements can be a great addition to balance out your pet’s food, but there’s some important principles to note to ensure you are actually supporting your dog’s health rather than potentially compromising it. Firstly, a little goes a long way or as the old adage goes, “less is more” when it comes to any kind of supplement. You should be aiming to create a healthy balanced meal as the core part your dog’s meal rather than relying on supplements to make up for major nutritional deficiencies in the diet. In many instances, supplements in excess can be quite harmful to your dog’s health. I also like to rotate these additions over a week rather than try and add them all at once, particularly if they are nutrient dense. In general, I also prefer my supplements as whole foods rather than synthetic extracts. Nature has been astoundingly adept at creating perfect little nutritional packages to sustain life; whole foods contain a complex but usually complementary nutrient mix that works in harmony to nourish the body when the digestive system is working optimally. 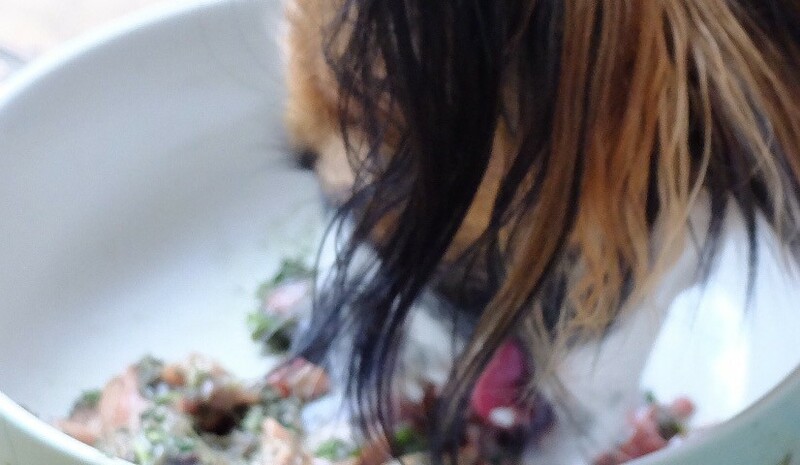 And finally, make sure you are feeding whole food supplements that are appropriate for the species; while dogs can benefit from most of the foods that humans do, there are some important exceptions (cocoa, grapes, some nuts, excess of garlic for example), which in some instances may even be toxic to the animal. Equally, what might be fine to add to your dog’s meal may not be so great for your cat or other pets. So it is important to do your homework or seek the advice or a professional holistic practitioner. Sea vegetables such as kelp, are some of the densest sources of minerals and amino acids of any plant. They are high in the the element iodine, which is crucial for your dog’s thyroid health and general metabolism. Most land sourced foods are low in iodine due to its depletion in our soils. 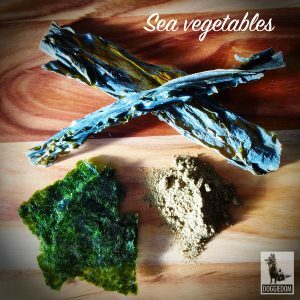 Seaweeds are also a good source of tryptophan, which I covered in a previous blog about foods to help manage your dog’s behaviour and can help with maintaining healthy skin and a shiny coat. In addition to iodine, kelp is high in other minerals including iron, magnesium, calcium, potassium with smaller amounts of zinc, selenium and copper. It has vitamins A, B1 and 2, E, D and K. It also contains a substance that helps remove heavy metals from the body. It has properties that help reduce inflammation, prevent tumours and may even be useful for preventing rheumatic conditions. Be cautious about using kelp if your dog has been diagnosed with any type of thyroid issue, and seek the advice of your vet. Kelp supplements can come in powder or liquid form or you can also look at dried seaweeds. Similar to kelp, algae is also a very dense nutritional powerhouse, packed with phytonutrients and minerals. One of the most commonly known algae is spirulina. Besides being high in protein, it also contains essential fatty acids 6 and 3 and has high levels of Vitamins C, E and B complex. Its anti-inflammatory properties and easily digestible proteins make it ideal for elderly or unwell pets too. Spirulina is great for supporting the immune system, gut health and for dogs with allergies. How much? About 1/2 teaspoon per 5kg of body weight (depending on your source and iodine levels which can vary) for kelp and 1/4 teaspoon of spirulina per 1/2 kg of food. Don’t feed strips of dried seaweed to your dog as they can swell and cause a blockage. Powered or ground up kelp or other seaweeds are the way to go. When feeding raw and it essential to make sure that your dog is getting at least the minimum nutrients essential for their good health. Two minerals that can be deficient in many raw home made meals, particularly those lacking in offal, is manganese and zinc. Manganese supports calcium absorption, bone and connective tissue growth (so it is obviously essential for puppies), blood sugar levels and immune function. Zinc is important for a number of metabolic actions in your dog’s body, from the immune and endocrine systems, through to bone growth, brain development and function, eyesight and healthy skin. But both of these minerals are only needed in small amounts, and in excess, will do harm – so again, a little goes a long way. Mussels and oysters have high levels of manganese and zinc respectively and so they are a great addition to your dog’s meal without too much risk of overdosing – that is if you don’t feed too many! In combination they are a great source of Vitamin B12, iron, selenium and the very beneficial Omega 3. And if you can get hold of some of those precious Green Lipped Mussels, then you have the added bonus of their great anti-inflammatory action. They are a great source of glucosamine and chondroitin for dogs with ailing joints. Fresh is great, but not always convenient. I get dried (including freeze dried) mussels and tinned or jarred molluscs. If your dog isn’t so keen on them, I suggest grinding them into the food. How much? 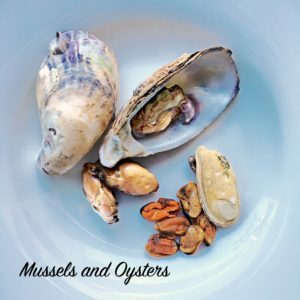 Add in one-two mussels or oysters – fewer for smaller dogs, a little more for larger- (adtogether or as separate supplements a couple of times a week) as an instant boost to your dog’s meal every few days. Probiotics are essential bacteria that support great gut health. To me, a healthy gut is the foundation of wellness and longevity. If your dog has been consuming predominantly processed and cooked foods for most of his life, or had to have antibiotics at some stage, chances are his gut ‘biome’ is not as good as it could be, putting him at risk of a number of health issues. Some people choose to give their dog a probiotic tablet or powder, which may be more convenient. If you do choose a supplement probiotic, it is best to get one especially formulated for dogs to support the optimal biome for the canine gut. But for me, I can’t go past the whole food probiotics contained in fermented foods, whether that is dairy based ones (if your dog tolerates it) or vegetable based. As outlined in my story about “Should my dog eat vegetables and fruits”, vegetables can be an excellent nutrient and enzyme boost to your dog’s diet generally. Of course their benefits can only be realised if they are prepared in a way that your dog can digest them. 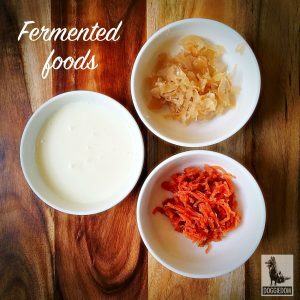 Fermenting does this beautifully, as the bacteria have already done all the hard work breaking down the plant structures ready for your dog to absorb the goodness from them, in much the same way that your dog would get by eating the contents of herbivorous prey. Depending on which vegetables you ferment, they are generally high in vitamin C, B complex, vitamin K, and are a rich source of enzymes. Fermented vegetables also produce lactic acid which seems to have cancer fighting abilities. Fortunately there’s been a bit of a resurgence of fermented foods in stores, so they are readily available. Most supermarkets stock some basic sauerkraut – just remember to read the label about whatever it is you are buying! But it’s actually pretty easy to make your own. In my next blog I will show you how simple it is! I like to feed a mix of fermented veg including sauerkraut and fermented carrots with pumpkin seeds. On the dairy side, I go for plain yoghurt or kefir and find that sheep and goats based products are a little more readily absorbed. If you are lucky enough to live on a farm you could make your own raw kefirs or yoghurts for the most potent probiotic punch! How much? A little goes a very long when it comes to fermented vegetables. Too much can cause tummy upsets. Start with a quarter teaspoon for small dogs to one teaspoon for larger dogs, finely chopped, and watch your dog’s reaction over a couple of weeks. Gradually build up to about to quarter to one tablespoon relative to your dog’s size if it is tolerated.